The Real Cause of Climate Change: Deforestation! 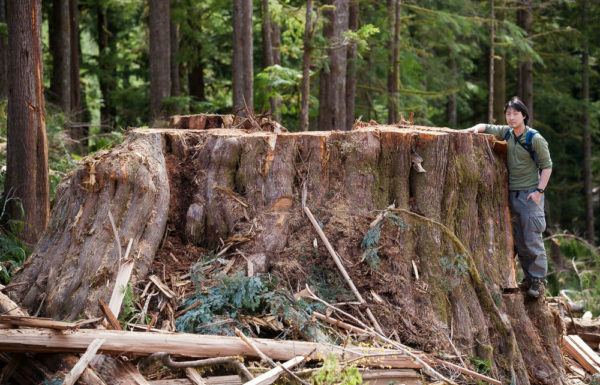 Vancouver Island – Ancient Forest Clearcut near Port Renfrew, BC. Photo: TJ Watt. It occurred to me what the biggest contributor to climate change was while teaching a unit in our Permaculture Design Certificate (PDC) course. The greatest driver of climate change or global warming is not fossil fuel greenhouse gases! I was teaching a permaculture course unit called, “Trees and Their Energy Systems” AKA “We love trees!”. Our PDC course is held late July in southern Oregon where summer temperatures average the mid 90s˚F (35˚C). We teach under two large willow trees to avoid the direct heat of the sun. Its cool and comfortable in the shade under the old trees. If you step out into the direct sun, temperatures jump 12–15˚F . The shade benefit a modern structures such as a roof overhang or a shade greenhouse is about a third of that from mature trees. Trees transpire moisture, let the air breath through the canopy and you are in physically in contact with the 65˚F (18˚C) cool soil. Deforestation is not just the absence of forest in its Natural area but the absence of the original old growth forests, prairies, meadows, riparian and waterways. Deforestation has been looked at by biologists far too narrowly. Deforestation is dediversifying© and is the precursor to desertification. We only see it as deforestation because destruction of American soils and ecosystems are recent. Some vitality remains but with each whack of the plow and the ax it dies more. Visit the Middle East, parts of eastern Europe, Asia, Africa to see that what was once forest is now scrub or desert. Civilization is the destroyer of ecosystems. 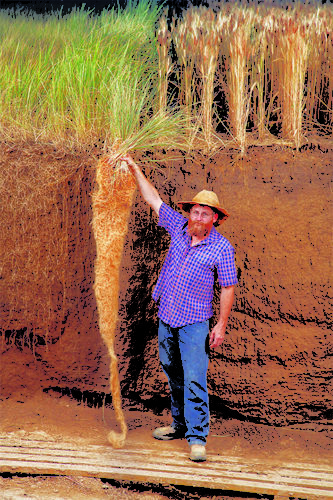 Jerry Glover, a soil scientist, shows off a perennial wheatgrass plant’s long roots, which grow deeper than annual plants’ roots, improving soil structure and reducing erosion. Photo: Jim Richardson. Without the old growth trees you do not have the cool canopy, understory, shrub layer, ground cover nor the soil tilth. Without the prairie and meadows you do not have perennial forbs, deep roots, mineral recycling nor the buffalo and the wolf. Without the un-dammed waterways you do not have the salmon and trout bringing fertility back up stream, nor the bears spreading the salmon into the forests, nor the beavers hosting biodiversity in their ponds. Without any of these you do not have all of the original players providing their energy and offering their contributions AKA biodiversity. Deforestation is more than logging. Deforestation is all agriculture and grazing. Deforestation is damming rivers. The only way to enable Nature to do her job is to stop interrupting her efforts to heal herself by setting succession back each season, by plowing, over grazing and cutting land into property. Before Europeans invaded the valleys where I live, they were covered with camas bulbs and the rivers ran wild with salmon. South of here 400 to 600 year old oak trees yielded 500 pounds of acorn meat a year, one tree! The settlers f*cked it all up. Think buffalo instead of cows. Diversity is not complete unless you have an uninterrupted mature old growth ecosystem. The landscape we believe is normal is completely man-made. It is less than a shadow of what Earth really looks like. Go to the old growth redwoods, fall to your knees and kiss the ground. This is what Earth really looks like! Look at the sidecuts of streams, the soil loam is 2 to 10′ deep! When you drive out of the park and look around, you will get it. Civilization has ruined the world for greed. Poster for the film Damnation. 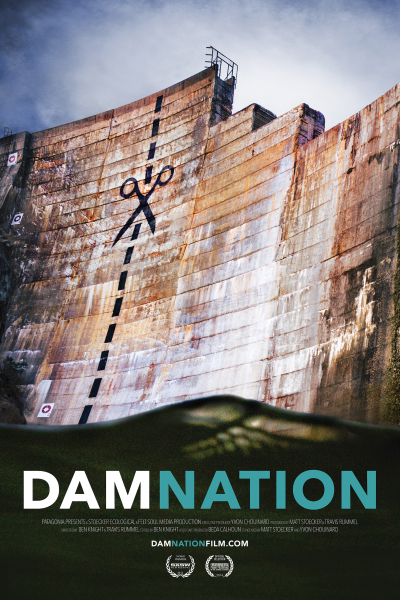 Watch the trailer at http://www.damnationfilm.com. It takes thousands of years to stitch the diversity back together. This assumes, the required species still exist in the region. If not, it then takes Nature millions of years to re-evolve new species to replace the niches of extinct ones. Imagine re-evolving the beaver or the salmon. Damming rivers is like clogging your own veins. Hydro power is dirty energy. Watch the Damnation trailer. I had to use deforestation in the title because no one knows what dediversifying is until this article. Now you know, the article title should be, The Real Cause of Climate Change: Dediversifying! We have removed forests and prairies from almost 60 percent (2) of all land for human habitation. In other words, we have turned the heat up 10–15˚F (3) on 60 percent of the land. 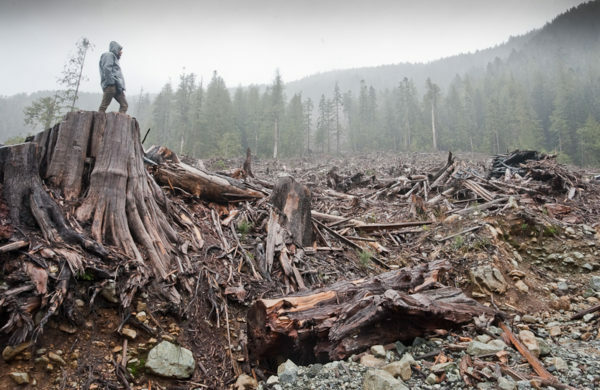 Deforestation is literally a radiator on 18 percent of the total earth’s surface. Heat islands caused by deforestation are concentrated on the equator where the sun’s rays land most directly. Interestingly, 18 percent x 13˚F is 2.3 percent, close to the one percent increased average global surface temperature over the last century(4). All forests and fields are not equal in their benefits. I estimate when you walk from a modern immature woods into the old growth redwoods, the temperature drops 10˚F in the summer, the humidity increases 10 percent and the oxygen level increase a few percent. The bottom line is that the climate benefit of a plantation of 30′ (9m) trees is insignificant compared to a forest of 200′ (61m) old growth trees. It’s like comparing a dog to an elephant. Agricultural land is also has little of the climate benefits of forest or perennial prairie lands. Perennial forbs can grow 6–8′ tall with roots just as deep. Ag land is also bare much of the year absorbing heat directly into the soil. Fields are plowed every year releasing carbon sequestered during the growing season back into the atmosphere. Directly reflecting heat by removing vegetation cover. Releasing greenhouses gases through clearing. Preventing forests from sequestering more carbon dioxide by cutting them. As far as I know, I am a permaculturist not a scientist, that scientists have not proven the higher greenhouse gas levels are actually causing rising temperatures. They show a correlation between higher CO2 emissions and rising temperatures. What is omitted from this correlation is that deforestation over the last century has also risen with temperatures. A greenhouse is actually a bad metaphor because it causes higher temperatures not by keeping the sun rays from existing the greenhouse but by blocking the wind. If you had a flat-roofed greenhouse with no sides high enough off the ground, there would be very little temperature increase caused by the clear plastic roof. I know I have several greenhouses. When you lower the sides of a greenhouse the temperature drops immediately with the improved air circulation. You could even argue that the haze caused by air pollution is actually shading the planet, therefore canceling out the greenhouse effect of the CO2. The remaining rainforests are the lungs of the plant. If we lose these forests, we lose the fight against climate change. We need to find a way for industry to make money by leaving the forests standing intact. Allowing the financial markets to profit form carbon trading is probably the solution. 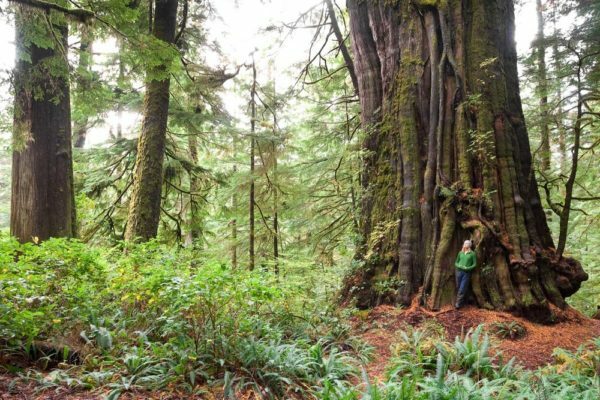 If all of the original old growth forests were still standing and prairies were still as tall as a man on a horse, then there would be no climate change. The problem with civilization is that it makes us want to have our cake and eat it too. We want to consume and populate and have everything be okay. Well, we have destroyed almost every intact ecosystem replacing it with an immature one or monoculture that does not work nearly as well as the original mature ecosystem. Nature is now taking away the fruits of her services: the cool air, the clean water, the fertile soil and the fecundity of diversity is leaving us. Of course the place is heating up because we broke the planetary air conditioning system. The Law of Environmental Amnesia: We live too short a time to appreciate the damage we are causing with your lifestyle. For your part, stop procreating, stop consuming, get into the wild, plant some native trees, tend a wild place in community, and take a permaculture course. We love trees! What Happens with Climate Change? Short answer, California becomes the Middle East. The bad news is that your children’s children will live it, if they are alive. Most agricultural land today will not be farmable. Much rainfall will disappear because we removed the forests that create the clouds. Again, you caused it but you will be dead when it happens. You ancestors may damn you. Ken Wu with large stump, Port Renfrew, BC. Photo: TJ Watt. To stop this insanity and climate change, we have to start living renewably in community. Read more in our Solutions articles. Cheewhat cedar are Canada’s largest tree. Photo: TJ Watt. (1) Deforestation: Here’s what you need to know about the warming planet, how it’s affecting us, and what’s at stake. National Geographic. (2) Agricultural land, 27 percent. The World Bank. Forest land, 30 percent, Wikipedia. Of the forests 13 percent is uncut rainforest, Mongabay. 96 percent of the old-growth forest has been logged, wikipedia. Three percent of land is covered by urban areas, Life Science. The earth is covered 70 percent by water, Charts Bin. (3) Trees and Local Temperature, eXtension, 2016. (4) Climate Change: Global Temperature. NOAA, Climate.gov, July 1, 2015. (5) Deforestation and Its Extreme Effect on Global Warming. Scientific America, 2012. (6) Deforestation and Global Warming. Scitable, Nature Education, May 19, 2012. (7) Deforestation causes global warming. FAO, 2006. (8) Deforestation: The Hidden Cause of Global Warming. Common Dreams, 2007. (9) Measuring the Role of Deforestation in Global Warming. Union of Concerned Scientists, December 9, 2013. (10) Tropical Deforestation: Climate Impacts: Rainfall and Temperature. NASA, Earth Observatory, March 30, 2007. (11) Crater Lake’s annual snowfall consistently decreasing. Statesman Journal, April 18, 2014. (12) Deforestation: The hidden cause of global warming. Independent, May 14, 2007. Top and bottom photo(s): TJ Watt, Conservation Photographer. Deforestation was a significant contributor during the long term. However, the decadal rate of temperature change in the Northern Hemisphere is much more rapid. The rate of change for the 1996-2016 period was nine times that of the preceding five decades.